There is no doubt social media works in the private sector. But can it work in the public sector? Even though the private sector benefits from social media with an increase in sales, government can benefit from it in other ways. Whether your objective is to increase awareness, decrease call centre costs or change behaviour, if used correctly, social media can be a powerful channel. 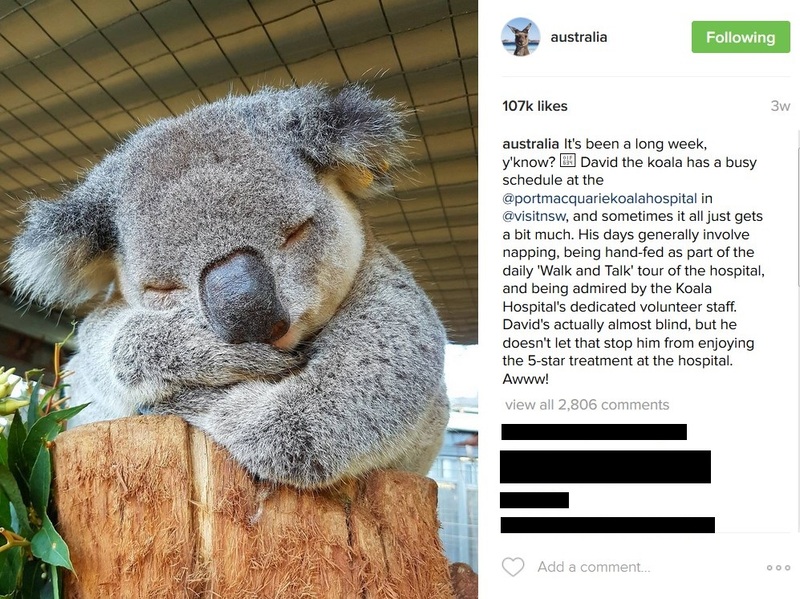 With over 2.3 million followers on Instagram, Tourism Australia is arguably one of the most successful social marketing strategies used by the Australian government. Tourism Australia shows some of the most breath-taking landmarks in Australia to inspire travellers to visit the country. The best part is, the content is largely user generated. The engagement of Tourism Australia is definitely strengthened as followers witness first-hand experiences of locals and tourists travelling in and around Australia. 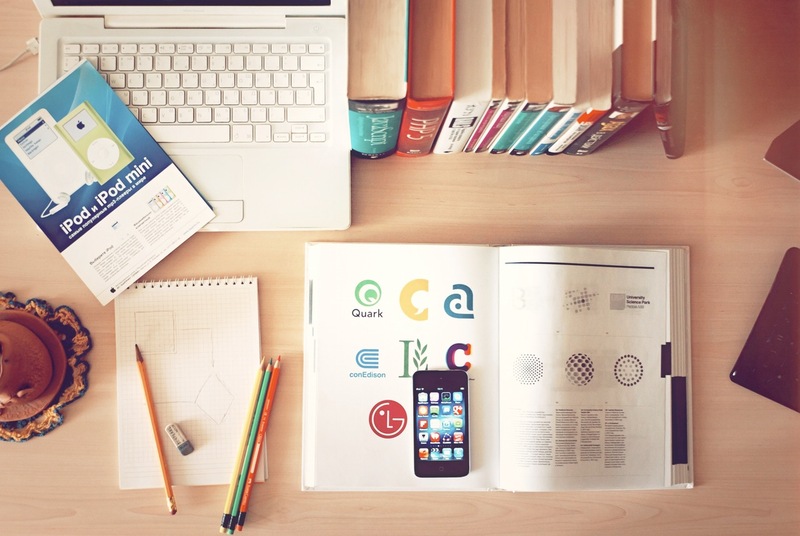 Content for the people, by the people—what can be more engaging and exciting than that? In the previous years, the Australian Federal Government’s Department of Human Services received complaints from critics who argued how challenging and time-consuming it was to claim social security payments. 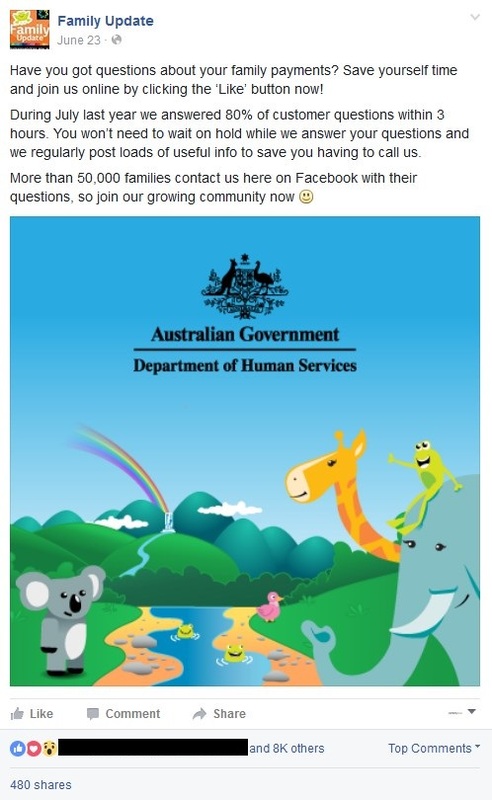 As a response, the department launched the Facebook page Family Update to provide further assistance to families who rely on Child Support payments, Centrelink and Medicare. The principle here is quite simple: If people can’t get clear access to the government’s services, take the service right to their doorstep. Since Facebook is a platform where real humans connect, setting up Family Update became phenomenal as it built a solid bridge towards people. Now, Australians can ask questions and get relevant information on platforms they already use. Reaching over 3 million Facebook ‘likes’, the U.S. Marine Corps tops the chart in terms of raising awareness and engaging locals in current societal issues. The posts on their Facebook wall range from famous quotes to true stories of marines to press releases. The beauty behind this Facebook page lies in its power to move people by awakening their consciousness on what happens on the battlefield. Aside from inspirational stories which speak to the hearts of its followers, residents are also given the opportunity to learn about the latest U.S. military news, including technology, policy, speeches and honours to the fallen. This variety of high-quality content keeps their audience engaged. New Zealand Police Recruitment recently posted a video on Facebook which went viral. 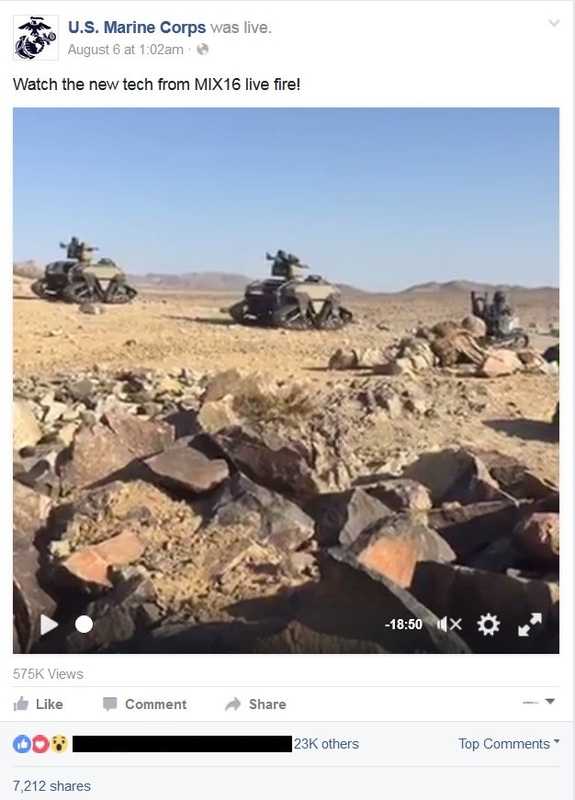 Across all platforms this video received over 10 million views. On Facebook alone, users shared it almost 100,000 times. They did this by creating what would usually be seen by government as a courageous video. This video of dancing police officers is fun, funny and definitely not the norm for government. The underlying business objective was to increase recruitment to the New Zealand Police. This video aimed to change the public perception of the work culture of the New Zealand Police. Anyone watching this video would smile and build a positive association with the New Zealand Police. Many other police departments around the world replied to this video with their own version of the Running Man Challenge. Police departments ranging from the Australian Federal Police to the New York Police Department to the Scotland Police created response videos to this challenge. Tens of millions of citizens all over the world viewed these videos. James Kliemt, Senior Digital Media Officer for the Queensland Police Service, created the largest police Facebook page in the English-speaking world with over 750,000 Facebook ‘likes’. The Queensland Police Service Facebook page is used for emergency management. It became the go-to news channel for the 2010-2011 Queensland floods, one of Australia’s largest natural disasters in decades. Now the Queensland Police Service, and hundreds of other police departments around the world, use social media for crisis management. 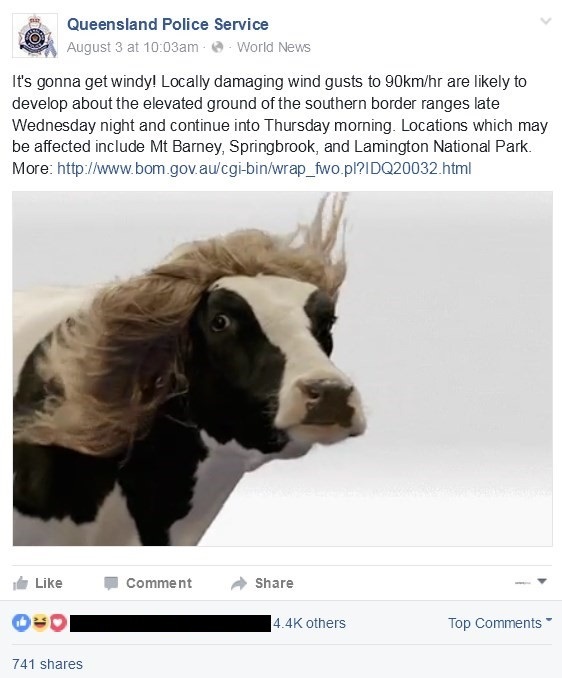 The above animated graphic posted by the Queensland Police Service is a humorous way to warn citizens of the potential dangers of high speed winds. Users shared this warning over 700 times. Police services now use social media to solve crime. They crowdsource tips on missing persons, the whereabouts of criminals and other information needed to prosecute offenders. In the 2015 Social Media Survey of over 500 law enforcement agencies in America, the International Association of Chiefs of Police found 76% of respondents used social media to solicit tips on crime. With this intelligence police have solved crimes. The success of a social media marketing strategy can never be measured by the number of followers or ‘likes’ you get on Facebook, Twitter and other social media platforms. Rather, it is by achieving organisational objectives. And these objectives are often aided by creating genuine connections with citizens because at the end of the day, without audience trust your messages will never be heard. If you are interested in learning about how other public sector organisations are using social media, check out Digital Engagement’s large collection of public sector social media examples.